Is the Engineering Design Process Really Important? As a teacher, I am sure you have been overwhelmed! The last week of school, the first week of school, right before report cards go out, parent conference week, during an observation, and so many more occasions are when we all get that feeling that it's just too much. That is the exact situation I was in a few years ago when I left the regular classroom to take on a STEM Lab position. I spent the entire summer decorating and organizing the lab and then started gathering resources. Now, let's talk about those resources! I had practically nothing and most of the idea books I had were too difficult for my age group. There was, however, one thing I began to see in those resources- over and over. It was the Engineering Design Process and I began to think that this little process might be important for STEM. I Had Some Questions about the EDP! What exactly is the Engineering Design Process? Do I need to make sure we use it? How does the EDP work? Is it STEM if I don't use the EDP? Will students benefit from using any kind of process? And, then, of course, I needed some posters... more about that later! The easiest answer to that question is to look at the Scientific Method. The EDP is similar. Both begin with a question. The steps that follow lead students through a procedure to keep them on track- planning, creating, improving, and sharing. This was one of my biggest questions as I started to create challenges. Everything, everything, I read about STEM mentioned this process so I decided it must be a big deal. Let's see if a visual will help you understand! The photo I used above is from a challenge that involves building a working drawbridge. It's such a fun challenge! How about I talk you through the challenge and stop and explain the EDP steps along the way! We started by talking about drawbridges as we examined the question being asked in the task. That's the EDP Ask Step. How can you use the materials to design and build a working drawbridge that follows all the task constraints? This immediately started the class talking about what a drawbridge does, how it works, and what kind of materials we will use. This is the Imagine Step and it sometimes begins with very little direction from me. In this challenge, the kids were excited and ready to learn. This led right to a quick video showing some working drawbridges. We watched a few bridges opening (in different ways) and talked about why a drawbridge would be needed. This discussion satisfies one of the components of the EDP- which is to add a real-life application to the task. Now, to be honest, not every challenge is as easily applicable to the real world, but setting a premise for the challenge is important. Next, we started Planning- with some crossover with Imagining. At this point, students wanted to see the materials to help make decisions about the bridges. Above is a photo that perfectly captures the beginning of the Planning step. The group is talking about all of their ideas and using the materials to see how they will work together. It is fascinating to watch kids do this and dicker with one another over the ideas and materials. As students finished the planning and made decisions, they started building their device or structure. This step is the Creating phase. We gathered materials and assign jobs. 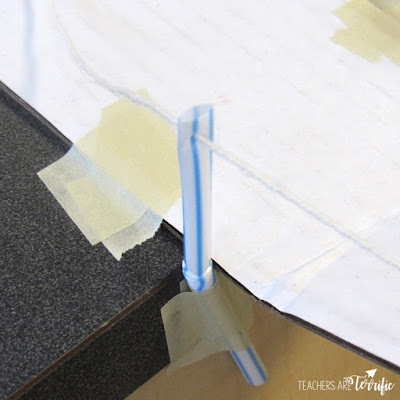 How will students create a working drawbridge using cardboard and string? The biggest problem we encountered is the center opening of the bridge. Many groups find that the opening needs extra support. Above - another team had a similar cranking device, but they took it a little further. They attached the turning pencil to the top of the bridge support and had a cranking system that would turn it. They also explained that a real-life bridge built like this would have a motor to turn the crank! The last step of the EDP is Sharing/Reflecting. We always stop and have each group present their final structure and talk a little about it. 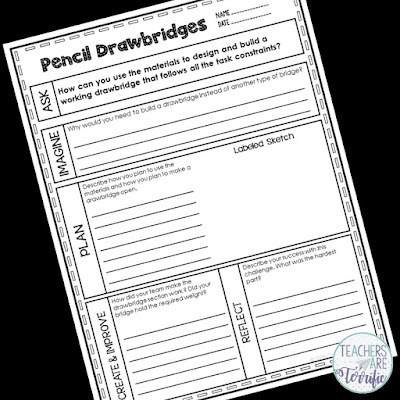 The lab sheets also have a component that includes reflection questions. That is a great question and it is one I pondered over. Do I really have to include the EDP? Longer answer- let's try a visual! 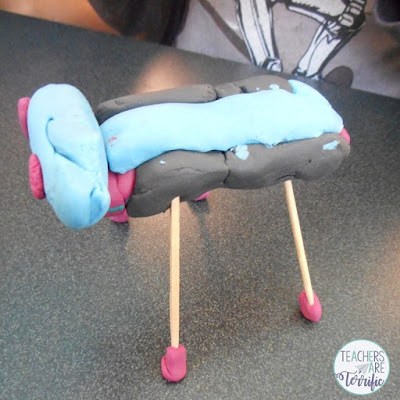 One day, I found some clay in my cabinets and decided to try some sculptures with third graders. Above is a little dog. It's very creative. But is it STEM? So, was this a STEM Challenge. I would say it was not. It was a craft. We are engineers. We gather information by researching and learning. We tackle a problem head-on by knowing what we want to accomplish before we begin. We have a problem to solve and the steps we need to take to solve that problem. We know the requirements of the task and what the materials will be. We plan according to those things. We brainstorm like crazy and think outside the box. We bring imaginative solutions into those planning discussions because we have discovered that the zaniest ideas do sometimes work. We draw and talk within teams because we have also discovered that the brilliance of teamwork is what makes STEM an amazing process. We decide on the materials based on our ideas and we create. As the devices are being made we improve immediately as we see that something is not working. We have learned that this is real life! We collect data as we test structures and make informed decisions as we move forward. Well, the next part of this for me was to find posters to show the kids in my lab about the steps of the EDP. I could not find sets of posters. The only thing I could find were one-page "posters" or flowcharts showing the EDP cycle. That is not what I wanted! So, I made my own posters in colors to match my classroom. Since then I have created many, many more sets of posters. I am including the links below for you and there will be a post coming soon that is only about the essentials of decorating for your STEM classroom! 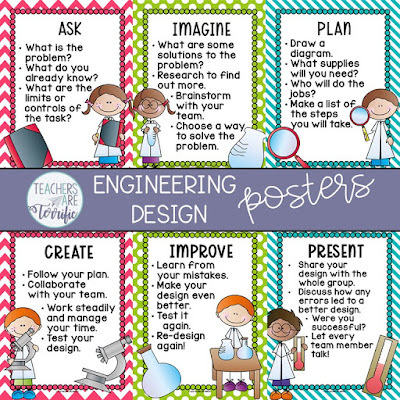 Tackle the Engineering Design Process - With Kids! The Must-Haves for Your STEM Decor - COMING SOON!